Point-and-shoot cameras teeter on the edge of extinction, rendered obsolete by our smartphones. But shooting with iPhones or juggling our Android handsets aren't always the best or most comfortable; just the most convenient. What's the solution? HTC thinks they can ease our collective mobile photography pains with a camera that looks like a periscope. HTC's philosophy is that we're all trapped behind the screens of our smartphones when we capture important moments in our lives, whether that's a child's birthday or a Jay-Z concert. RE is lightweight, simple, and out of the way so that allegedly, documenting your life doesn't keep you from actually experiencing it. RE is meant to appeal to selfie-taking teens, busy parents, and urban socialites in need of an easier way to take photos. But it's hard to say if those people would pay $200 for this GoPro alternative when it arrives later this month. The RE looks like an upside-down inhaler or maybe a dislodged periscope from a miniature submarine. That's a challenge right off the bat, but the camera's curves make more sense once it's in your hand. The shape is all about ergonomics and is meant to be comfy in a "thumbs up" grip. Although comfortable, the way you hold RE feels aggressive. Sometimes it's like your fingers are wrapped around the handle of some weapon or your thumb poised over the button of a detonator. That's where simplicity comes in: that detonator button is one of only two hardware controls on the entire camera. The top chrome circle is the capture key. One quick press, and you snap a photo. Press and hold, and you switch over to video capture. The camera communicates through a series of Tamagotchi-like beeps to indicate when recording, switching modes, or taking a photo. Also like a Tamagotchi, it can get reeeaaallly annoying after awhile. Luckily, there's a silent setting. The other button is on the front of the device, right under the scratch-resistant lens, and only lets you switch in and out of the camera's slow-motion mode. Below that is a status LED that gives warnings on battery life and mode selection, and the microUSB port and microSD card slot on the bottom just about rounds out the tour. In some ways, HTC gets things very right. The glossy plastic design feels incredibly sturdy and once again shows off the company's design chops. The RE is also waterproof in 1 meter of water for 30 minutes, so it can handle rain or a quick dunk no problem. Although a non-removable 820 mAh is a bit small (about 100 minutes of video recording), RE conserves battery by automatically turning off when you set it down and waking up once it's in your hand. RE works in two different ways. It can be used as type of off-the-cuff Flip Cam by just snapping pictures and recording video without discretion. Its 146-degree lens can confidently capture everything in frame. It's a comfortable fit between GoPro's ultra-wide angle lens at 170 degrees and more common 90-degree views on normal lenses. Of course, there's the usual array of accessories include bike mounts, power extensions, and tripods—all sold separately. A separate waterproofing pack also firms up RE's H2O protection to IP58: 2 hours underwater with a maximum depth of 3 meters. But I didn't get to try the camera in any extreme scenarios. You can also connect to your smartphone via Bluetooth. Once you open the free iOS or Android RE app, you can see a livestream view of what the lens is seeing to get more accurate shots, adjust time lapse settings, set image quality, and tons of other options. The app also integrates with the Zoe app, HTC's Instagram-esque social network that languished for a few months in beta. Today, version 1.0 hits the Google Play store with iOS coming later in the fall. The RE app is 100 percent necessary as it's the only way to view your photos quickly unless you link up with a laptop or PC. It also brings some good functionality with an intuitive interface to capture time lapses and certain scenarios where one person can watch the camera feed while another holds the RE high above a packed concert or running along the sidelines during a kid's soccer game. Or something. During my time with the camera, the very act of pulling out your phone to use as a Bluetooth viewfinder felt like it contradicted the idea that RE is somehow supposed to make my life easier. "Why don't I just use my smartphone?" was the thought that constantly popped into my mind. RE does bring a certain randomness and surprise to photography similar to disposable cameras and old-school Polaroids, so perhaps it fits that niche: more about fun and different way of capturing photos that necessarily scoring high marks for practicality. During my two-day demo, I experienced hiccups with Bluetooth connection and various frame rate issues, which HTC says upcoming updates before launch will fix. But that's not what's really wrong with RE. This camera requires you to put a lot of trust in the hardware—that it's actually taking the pictures you want to take and capturing the moments you want to capture. Mini time lapse taken at one picture every two seconds for 3 minutes. When trying to take evening shots of the Brooklyn bridge, for example, I had no idea that all my photos were actually blurry until I fished my phone out of my pocket. By then, the moment was gone. It's disappointing moments like that which made me wish I'd just used my smartphone in the first place. The 16 megapixel sensor may be higher quality than your average smartphone, but the image quality was just OK and video capture was unavoidably jerky and equally average. HTC says it still has many software builds to go and image quality should improve with every update, but it seems impossible that it will outclass smartphones enough to warrant the price—or the need to lug another gadget when going out. Because let's be real, it's not like you're going to leave your smartphone at home. 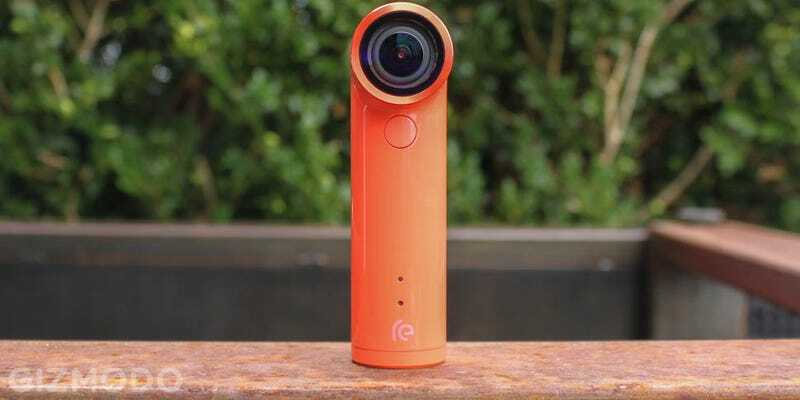 In some ways, RE is just a well-designed fun little device for taking photos in unconventional ways, but it won't magically make your smartphone experience any better. The camera's name "RE" is a clever play on words like reimagine, rethink, or reframe, but I couldn't shake the feeling that "redundant" is the right phrase.